Delicious Asian noodles doesn’t get easier than this. Simply cook linguine according to your package directions. Whisk up the rest of the ingredients and pour on top of your noodles. Toss and enjoy anyway you like. We had ours with stir-fry veges. It was clean out the produce drawer night. I had cabbage, yellow pepper, carrots, green onion and purple onion. I sautee my veges over medium heat in a little olive oil and a touch of sesame with freshly ground black pepper to taste. Who needs meat? If you insist, Asian sesame honey chicken is the bomb or try the same freezer marinade with steak. 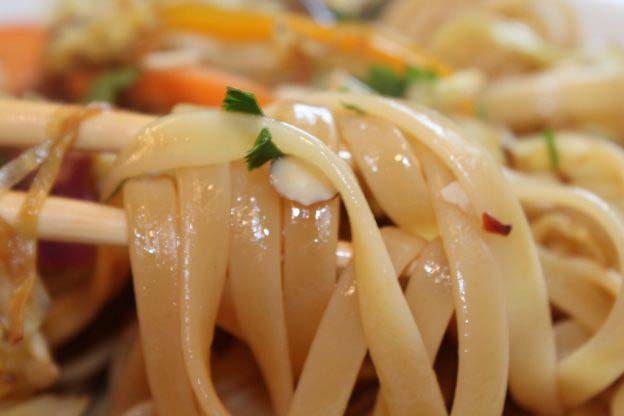 Now go ahead and add this Asian noodle recipe to your menu. Cook noodles according to package directions. Whisk the remaining ingredients and toss with noodles. Enjoy hot. How will you serve your simple sesame noodles? This entry was posted in 15 Minute Meals, Casseroles + Pasta on 15.05.2013 by admin. I like the fact that it has a lot of vegetables. Makes it a complete dish with all the needed nutrients. The choice of vegetables also made the presentation great because of the colors. I LOVE your recipes like this. So easy, frugal and simple to make using all pantry items. Thank you Jackie!! Thank you Brandette, I LOVE easy too, that’s why I keep posting them. You’re so kind to leave comments. Have a super blessed week.